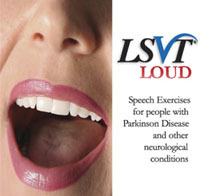 LSVT Loud therapy is administered by an LSVT Loud Certified Speech therapist.This therapy improves both the voice and speech of individuals with Parkinson disease by treating the underlying pathology associated with the disordered voice. Treatment focuses on improving vocal loudness and immediate carryover into daily communication enabling patients to maintain and /or improve their oral communication. The LSVT Loud is administered on an intensive schedule of 16 individual, 60 minute sessions in one month’s time. 90% of patients improve vocal loudness from pre to post treatment. Approximately 80% of patients maintain treatment improvements in their voice for 12-24 months post treatment. People with PD may notice changes in or difficulty with chewing, eating, speaking or swallowing. These changes happen at any time, but they tend to increase as PD progresses. Find out which treatment options are available for both speech and swallowing difficulties now. By a speech-language pathologist who is a trained health care professional specializing in evaluating and treating people with speech, swallowing, voice, language and memory problems. Go to a recommended speech-language pathologist by asking your physician/primary PD health care provider. The Lee Silverman Voice Treatment (LSVT®). The first speech treatment for PD proven to significantly improve speech after one month of treatment. Exercises taught in the LSVT® method are easy to learn and typically have an immediate impact on communication. Improvements have been shown to last up to two years following treatment. LSVT® methods have also been used with some success in treating speech and voice problems in individuals with atypical Parkinson’s syndromes such as Shy-Drager syndrome, Progressive Supranuclear Palsy (PSP), and Multiple-System Atrophy (MSA). “LSVT® Alive! Homework Helper” is a 25-minute interactive videotape, which guides the user through a daily speech/voice strengthening session. You can visit LSVT® or call 1-888-438-5788. LSVT® must be administered 4 days a week for 4 consecutive weeks in order to be effective. On days that you have therapy, you should perform your LSVT® exercises one other time during the day; on days that you do not have therapy, you should perform your LSVT® exercises two times a day. Once you complete the 4-week LSVT® , you should perform your LSVT® exercises daily in order to maintain your improved voice. How can you maintain a stronger voice? Effective verbal communication like talking and listening to family, friends and coworkers are some of the most basic and valued activities of daily living. Even in the early stages of PD, many complain that their voices are too soft causing others to ask them to repeat themselves. Other PD patients may have a gruff or hoarse-like quality to their voice. So what can a person with PD struggling with a soft voice do? Take a breath before you start to speak. Pause between phases to take in another breath. Express your ideas in short, concise sentences. Drink plenty of water or other liquids each day (non-caffeine and non-alcoholic). Speak louder than you think is necessary. PD causes the voice volume to be lowered and you may not realize how soft your speech has become. But, do not shout over noise when you talk. Rest your voice when it is tired. Reduce throat clearing or coughing. Use a hard swallow or soft sound instead. If the air is dry in your home, use a humidifier. Encourage friends and family to ask you to speak louder or repeat yourself, if they cannot understand what you have said. If you have trouble with your speech, ask your health care provider to refer you to a speech-language pathologist who is trained in evaluating and treating problems with speech and swallowing. If you have any questions about speech problems, please visit the Talk to a Speech Clinician forum, where a team of experts answer questions regarding speech and people with Parkinson's disease. How do you know if you have a swallowing problem? __ I have recently lost weight without trying. __ I tend to avoid drinking liquids. __ I get the sensation of food being stuck in my throat. __ I tend to drool. __ I notice food collecting around my gum line. __ I tend to cough or choke before, during or after eating or drinking. __ I often have heartburn or a sore throat. __ I have trouble keeping food or liquid in my mouth. __ I have trouble moving food to the back of my mouth. __ It takes me a long time to eat a meal. __ I sometimes have trouble swallowing pills. __ My eating habits have changed recently or I have lost my appetite. __ Sometimes, I have fever for unexplained reasons. __ I notice changes in my voice quality after eating or drinking. If you checked off many of the items above you may need to see a speech-language pathologist for a swallowing assessment. Your physician or other health care provider can help you with a referral. If you have any questions about speech or swallowing problems, please visit the Talk to a Speech Clinician forum, where a team of experts answer questions regarding speech and people with Parkinson's disease.